The conversion of natural vegetation by agricultural areas modifies the soil attributes and may lead to the degradation of this resource. However, humans need agricultural production to supply food, fiber and energy, among other products to survive. The use of tropical soil should be based on management techniques that maintain the physical, chemical and biological characteristics of the soil, close to those observed in areas under natural vegetation. In the Atlantic region of Brazil, a large part of the forest areas were converted into agricultural systems such as pastures, and a smaller scale, poorly managed agroforestry systems may contribute to soil degradation. In addition, most of the small forest fragments are poor in species, and have lower soil quality than larger, and well-preserved, characterizing degraded ecosystems (Souza et al., 2012; Duarte et al., 2013). On the other hand, systems such as agroforestry systems and pastures, or natural systems when well managed or preserved, are alternatives to raise soil carbon (C) and nutrient contents while maintaining or improving their quality in this region (Guimarães et al., 2014; Rocha Junior et al., 2017). In the agricultural areas of the tropical regions one of the main limiting factors for vegetal production is related to phosphorus (P) availability in these soils, due to tropical soils being highly weathered, with specific adsorption characteristic (Andrade et al., 2003; Teixeira et al., 2016), which limits the P availability to the soil solution. The adsorption of P in tropical soils leads to high levels of P-total, which does not reflect its availability to plants (Rocha et al., 2005). In Brazil, the soil fertility assessment methods focus on the inorganic fraction of P, based on P-available as an indicator of the availability of this nutrient for crops (Rocha et al., 2005). The extraction with Melich-1 and resin has been used to evaluate the levels of P-available in these soils. However, it is known that other inorganic fractions are related to the dynamics and P cycling, in which they contribute significantly to the availability of this nutrient for a short (P available), medium (P moderately available) and long time (P restricted availability) to plants (Xavier et al., 2011; Velásquez et al., 2016; Kim Hoang and Marschner, 2017). Furthermore, it is known that the organic fraction of the soil is related to the availability of inorganic P fractions, either by competition for the same adsorption site, or by the physical impediment caused by the size of the organic molecules in the soil solution (Andrade et al., 2003). Although studies of OC in aggregate classes and soil P fractions have been developed in Brazil (Beutler et al., 2015; Pupin and Nahas, 2015) in the mares de morro region in the Atlantic forest biome, little is known regarding the relationships between OC/P fractions within the classes of aggregates, especially in areas subjected to the same management during long periods. In literature it is known that the organic matter content in the soil is directly related to the formation and stabilization of aggregates (Ferreira et al., 2007). Also, the systems that increase soil organic matter improve the soil quality and creates better condition of agricultural development (Signor et al., 2016). But how this dynamic occurs, aggregation/OC/fractions of inorganic P, in the main land uses of the Atlantic forest is not yet well explained. Xavier et al. (2011) with study developed in Ferralsols of the Zona da Mata of Minas Gerais found that the most available P fractions for the plants were higher in the agroforestry compared to the conventional coffee crop. The study indicated that the availability of P in the agroforestry system was associated with the cycling of P-organic, and that the insertion of tree species in the system promoted an accumulation of P-organic in the soil through the constant input of organic material in the layers of 0.00-0.05 and 0.05-0.10 m. Rita et al. (2013) studying a Ferralsols of the Northern region of Rio de Janeiro verified in soil under pasture lower content of P-available and P-total when compared to capoeira. The absence of fertilization and constant removal of nutrients from pasture through grazing was pointed out as causing of lower levels of P in the aggregates of this system. In the Atlantic forest where approximately 15% of the original territory remains preserved (Ribeiro et al., 2009), finding information under management systems that maintain characteristics similar to natural vegetation can help us to understand the sustainable dynamics of inorganic P in the soil (Xavier et al., 2011) and the role of organic matter in raising the availability of this element in soil solution in a tropical environment where the contents are generally low. Understanding this process can facilitate conservation planning based on different types of land use, aiming the efficient management of phosphate fertilization, as well as assisting in soil management in these conversion systems. 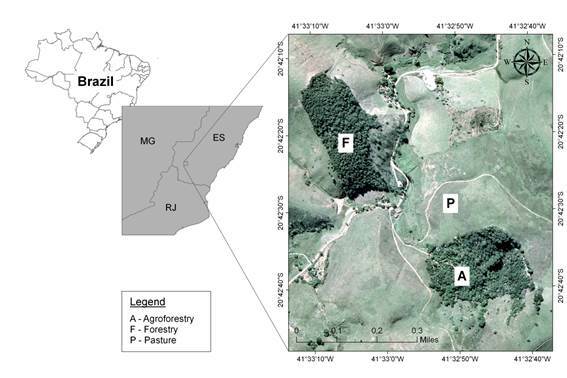 Therefore, the objective of this study was to evaluate the OC and the inorganic P fraction in different classes of soil aggregates, under forestry fragment, agroforestry system and pasture, submitted to the same management during long periods. The study area is located in the Atlantic Forest biome region, with vegetation typology defined as Semidecidual Seasonal Forest in the municipality of Alegre, Espírito Santo, Brazil. The experimental plots are located between the latitudes 20º 42 '11 "S and 20º 42' 41" S, and longitudes 41º 32 '39 "W and 41º 33' 11" W (Figure 1), with an average elevation of 397 meters. The regional climate is Cwa type, according to the classification of Köppen, with a rainy summer and dry winter. The annual rainfall is 1,346 mm, where majority of the rainfall occurs between November and March. According to the meteorological station of Universidade Federal do Espírito Santo, the annual average temperature is 22.2 °C, while the maximum and minimum averages are 29 °C and 16.9 °C, respectively. The regional relief is wavy. Figure 1: Map of the research area. To evaluate the effect of land use on soil aggregation, areas under forestry fragment, agroforestry system and pasture were selected, where management practices adopted in each type of soil use are the same for several years. The succinct description of each area is: Forestry established for more than 70 years under Ferralsol; Agroforestry established 60 years ago, where the Atlantic Forest associates with coffee, pepper, orange, palm tree and other cultures under Ferralsol; Brachiaria brizantha pasture established 0 years ago, without the use of liming, or soil fertilization, previous management with fire, currently in continuous grazing, under Ferralsol (IUSS Working Group WRB, 2006). The experimental design was based on a comparative-measurement experiment, with randomize replicate collection in each plot. This experimental model has been used in field studies, where local control of the variables is restricted to the selection of areas with similar characteristics (Hurlbert, 1984; Adewopo et al., 2014). The soil samples were collected in the layers of 0.00-0.10, 0.10-0.20 and 0.20-0.60 m depth, in three replicates. The collection was carried out in the middle third of the landscape. The physical and chemical characteristics of the soils collected are presented in Table 1.
a Cation exchange capacity (by 1N Ca(OAc)2 pH 7); b Base saturation; c Aluminium saturation; d Organic carbon; e Inorganic P. Granulometric analysis were performed by pipette method. pH in water (ratio 1:5); P extracted with Mehlich-1; Ca, Mg and Al extracted with 1 mol L−1 KCl and after that calculated the BS and m; All chemical procedures were performed according EMBRAPA (2011). Undisturbed samples were collected in blocks with dimensions of 0.10 × 0.10 × 0.05 m. The aggregate stability was evaluated in wet condition (Kemper and Chepil, 1965), using different sizes of sieves (0.25, 0.5, 1, and 2 mm mesh). A 50 g of soil aggregate was weighed after drying at 40 °C to obtain the aggregate data on a dry basis. Before the aggregate analysis, the soil was slowly wetted, by adding water up to saturation and kept for 10 minutes to remove entrapped air from the aggregates. Aggregates with a diameter between 2 and 4 mm were passed through a set of sieves, by shaking them for 15 min. This procedure was repeated until a sufficient amount of material was obtained in order to determine C and fractionation of P in each class of aggregates. After drying, the aggregates were crushed and 2 g of dry soil were passed through a 0.21 mm sieve, the total organic carbon (OC) were performed by wet oxidation with K2Cr2O7, according to Yeomans and Bremner (1988). In order to determine P dynamics, a sequential chemical fractioning was performed (modified from Hedley et al., 1982). Pbic readily available, were determined using 5 g of soil (air-dried fraction, ∅ 0.21 mm) added to a falcon tube with 30 mL of 0.5 mol L-1 NaHCO3 at pH 8.5. The tubes were shaken end-over-end for 16 hours and then centrifuged at 8000 rpm for 10 minutes. The supernatant was separated. Afterwards, 30 mL of 0.5 mol L-1 NaCl was added again and centrifuged and the supernatant was added to the previous extract, repeating this procedure twice. The inorganic P was measured in the sample with a spectrophotometer at 725 nm in the presence of solution 725 (1 g bismuth subcarbonate, 138 mL concentrated H2SO4 and 20 g ammonium molybdate) and ascorbic acid (EMBRAPA, 2011). Fractioning was performed following the same logic as described in the previous steps with the following sequence of reagents: 0.1 mol L-1 NaOH, (PNa1 - moderately available); and 0.5 mol L-1 NaOH (PNa2 -restricted availability). Aggregate stability was calculated based on the aggregation index and geometric mean diameter of aggregates, and the mean values and standard deviation in different land uses were showed. The results of the OC and the inorganic P fractions, obtained in the aggregate classes 4-2, 2-1, 1-0.5, 0.5-0.25 mm in each studied depth, of soils under different land uses (forestry, agroforestry and pasture), were submitted to analysis of variance (ANOVA) using the SISVAR Software (Ferreira, 2011). In order to compare the classes of aggregates within each soil land use, degrees of freedom for treatment were decomposed into three orthogonal contrasts, and the comparison was performed using the F test (º P < 0.20, * P < 0.05 e ** P <0.01). Afterwards, the degrees of freedom of treatment were decomposed into two additional contrasts to compare the soil uses (F , º P < 0.20, * P < 0.05 e ** P <0.01). The values of aggregation index (AI) and geometric mean diameter (GMD) are shown in Figure 2 and Table 3. The AI indicated that at all depths, most of the aggregates were retaining in the class greater than 2 mm. Evaluating the land use, higher values were recorded in the pasture with soil aggregates class higher than 2 mm. The forestry fragment showed the highest homogeneity of aggregates between the soil aggregates, however, the lowest values of the geometric mean diameter (GMD) were found in this management (Table 2). Figure 2: Soil aggregation index (%) under different land uses (forestry, agroforestry and pasture) in three depths (0.00-0.10 m, 0.10-0.20 m and 0.20-0.60 m) in a Ferralsol. In the superficial layer (0.00-0.10 m) the agroforestry system showed the highest value of GMD with 2.78 mm, while in the sub-surface layers the highest values were obtained in the pasture (Table 2). The mean values of organic carbon (OC) content and inorganic phosphorus (P) fractions are showed in Table 3 and 4. 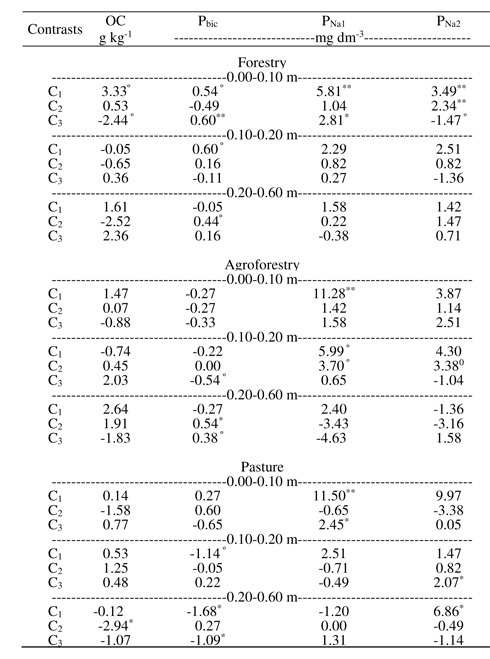 Within the forestry fragment, the 0.00-0.10 m layer showed the highest OC content in the higher aggregate classes 4-2 and 2-1 (P < 0.20o ) (Table 4, C1). At the same depth, the class of 0.5-0.25 mm presented the highest OC content compared to the class of aggregates 1-0.5 mm (P < 0.20o) (Table 3, C3). 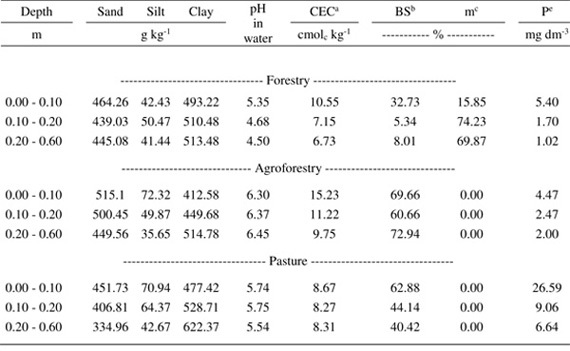 In the agroforestry system, the mean OC contents ranged from 4.94 to 7.12 g kg-1, with no differences between the classes of aggregates (Table 4, C1, C2 and C3). In the pasture, the OC contents did not differ between the classes of aggregates in the layers 0.00-0.10 m and 0.10-0.20 m, and the variation of the OC was between 3.41 and 6.51 g kg-1 (Tables 3 and 4). However, in the 0.20-0.60 m depth, the highest OC contents occurred in the aggregate classes between 2-1 mm, being higher than the larger aggregates 4-2 mm (P < 0.05*) (Table 4, C2). Table 3: Mean values of organic carbon (OC), and inorganic phosphorus readily available (Pbic - NaHCO3 0.5 mol L-1), moderately available (PNa1 - NaOH 0.1 mol L-1) and restricted availability (PNa2 - NaOH 0.5 mol L-1) under forestry fragment, agroforestry and pasture, in four aggregates classes (4-2, 2-1, 1-0.5, 0.5-0.25 mm) and three depths (0.00-0.10, 0.10-0.20 and 0.20-0.60 m). C1: (4-2 mm + 2-1 mm) - (1-0.5 mm + 0.5-0.25 mm); C2: (4-2 mm) - ( 2-1 mm); C3: (1-0.5 mm) - (0.5-0.25 mm); *, **, º significant at 1%, 5% and 20% respectively. Overall in all depths within the forestry fragment, the inorganic P (readily available, Pbic - 0.5 mol L-1 NaHCO3; moderately available, PNa1 - 0.1 mol L-1 NaOH; and restricted availability, PNa2 0.5 mol L-1 NaOH), showed high levels in the larger soil aggregate classes (4-2 and 2-1 mm) (P < 0.20o and P < 0.05*) (Table 3). The values of inorganic P readily available (Pibic) in the class of aggregates 2-1 mm numerically showed higher levels (2.72 mg dm-3) than class 4-2 mm (2.23 mg dm-3) when the superficial layer was evaluated (0.00-0.10 cm) in the forestry fragment. However, for fractions of inorganic P restricted availability (PiNa2) contrary behavior was noted (Table 3). The sub-surface layers (0.10-0.20 and 0.20-0.60 m) were higher in class 4-2 mm (7.17 to 2.62 mg dm-3) than in class 2-1 mm (2.18 a 6.35 mg dm-3) (Table 3). In the agroforestry system, the larger aggregate classes 4-2 and 2-1 mm, had higher mean extractable of inorganic P contents, which ranged from 5.38 to 17.46 mg dm-3 evaluating the P fractions in the moderate available (PNa1) and restricted availability (PNa2) (Table 3). The readily available (Pbic), moderately available (PNa1) and restricted availability (PNa2) in the pasture land use evaluating the superficial layer 0.00-0.10 m, showed numerically highest contents in the classes of larger aggregates (4-2 and 2-1 mm), varying between 1.91 and 15.51 a mg dm-3. However, difference was only found in P moderately available (PNa1) (P < 0.01**) (Table 4, C1). On the other hand, in the depth of 0.10-0.20 and 0.20-0.60 m no trend was verified (Table 3 and 4). 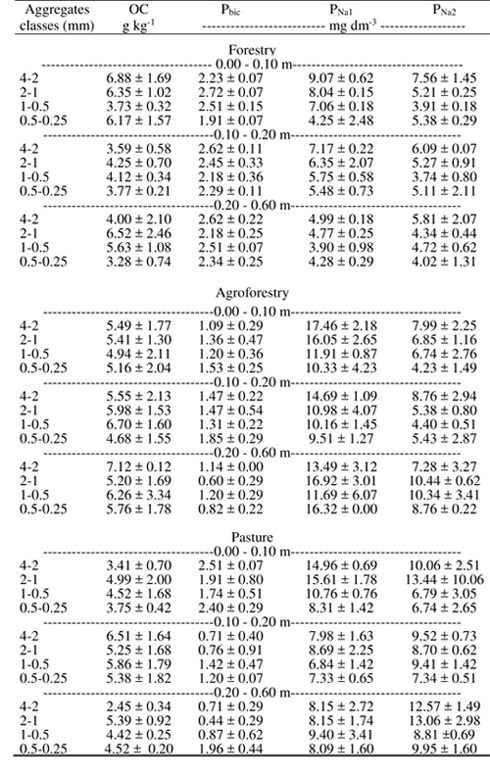 Soil aggregate classes of 4-2 mm and 2-1 mm, at all depths in the pasture, did not differ in relation to the contents of inorganic P (Table 4, C2). However, the aggregates class of 1-0.5 mm in the 0.00-0.10 m layer presented higher levels of P moderately available (PNa1) (1.42 to 10.76 mg dm-3) than the aggregates class of 0.5-0.25 mm (P < 0.05*) (Table 4, C3). In the P with restricted availability (PNa2), similar behavior was observed in the layer 0.10-0.20 m where the aggregates class of 1-0.5 mm showed higher levels (P < 0.05*) than the aggregates class of 0.5-0.25 mm. The superficial layer 0.00-0.10 m showed the highest mean values of OC contents compare to other depths (6 g kg-1) (Figure 3). The highest content in this layer was verified in the forestry fragment, being higher than other land uses (P <0.05*). Figure 3: Mean and ortoghonal contrasts for total organic carbon contents in all aggregates classes under three land uses (forestry, agroforestry and pasture), in three depths (0.0-0.10 m, 0.10-0.20 m and 0.20-0.60 m ). C1: (2*forestry) - (agroforestry + pasture); C2: (agroforestry) - (pasture). *, **, º significant at 1%, 5% and 20% respectively. For the OC in the superficial layer, no differences were verified between the agroforestry system and pasture. On the other hand, in sub-surface area (0.10-0.20 and 0.20-0.60 m), there was a higher mean OC content for the agroforestry system and pasture when compared to the forestry fragment (P<0.01**). When comparing the depth 0.10-0.20 m to agroforestry system and pasture, no differences occurred, however, in the depth 0.20-0.60 m, the agroforestry system showed higher levels of OC (P <0.05*) (Figure 3). When the inorganic P fractions were evaluated, in general, the P moderately available (PNa1) showed higher contents in the soil aggregates. In contrast, the lowest levels were observed in the readily available (Pbic) fraction (Figure 4). Considering the land uses, the readily available (Pbic) fraction, highest mean values in all depths (0.00-0.10, 0.10-0.20 and 0.20-0.60 m) was verified in the forestry fragment (P <0.01**) (Figure 4). Figure 4: Mean and ortoghonal contrasts for inorganic P readily available figure(Pbic - NaHCO3 0.5 mol L-1), moderately available (PNa1 - NaOH 0.1 mol L-1) and restricted availability (PNa2 - NaOH 0.5 mol L-1) in all aggregates classes under three land uses (forestry, agroforestry and pasture), in three depths (0.0-0.10 m, 0.10-0.20 m and 0.20-0.60 m ). C1: (2*forestry) - (agroforestry + pasture); C2: (agroforestry) - (pasture). *, **, º significant at 1%, 5% and 20% respectively. The greater availability of P moderately available (PNa1) was found in the agroforest system, ranging the mean values between 12.0 and 14.2 mg dm-3. The mean values of P moderately available (PNa1) in agroforestry system were higher when compared to the forestry fragment at all depths (P <0.01**), and when compared to pasture the depths of 0.10-0.20 and 0.20-0.60 m (Figure 4). The P restricted availability (PNa2), at all depths, was higher in agroforestry system and pasture when compared to the forestry fragment. However, the highest values were found in the pasture (Figure 4). The higher values of aggregate stability in the pasture and agroforestry, suggest that by removing the forestry fragment to establish those land uses improved this physical property of the soil (Figure 2 and Table 2). Highest percentage of aggregates higher than 2 mm found in sub-surface pasture is possibly related to the constant renovation of the root system in this vegetation, which directly influences the soil aggregation (Rocha Junior et al., 2017). Similar results were verified by Adesodun et al. (2007). The highest values of GMD in the agroforestry system found in the superficial layer (0.00-0.10 m) indicate that the time of establishment of this land use promoted a positive change in relation to the soil physical property, and consequently increased the soil resistance of water erosion process. A similar effect was observed by Guimarães et al. (2014) studying the effects of agroforestry coffee systems comparing them to conventional systems in Espírito Santo state. These authors verified that agroforestry systems promoted greater stability of aggregates. Possibly the highest organic matter content and the quality of the organic material deposited on the soil in the forestry fragment, may be influencing the stability of aggregates in the superficial layer (0.00-0.10 m) (Figure 2 and Table 2). The organic matter of soil can show as characteristic the dispersive or aggregating effect, being dependent on the quantity and quality of the material deposited on the soil (Benites and Mendonça, 1998). Although the forestry fragment showed lower values of aggregates stability, this system promoted the highest OC content in the classes of aggregates larger than 1 mm. In comparison between the smaller aggregate classes, the one located between 0.50-0.25 mm showed higher OC contents in the superficial layer (0.00-0.10 m). In general, high OC found in the larger aggregate classes when evaluating the forestry fragment, is possibly related to the diversity of organic matter deposited in the soil, which increases the inter-aggregate light organic matter content, and especially, intra-aggregate. This result reflects the constant renewal of the root system and deposition of litter in these areas (Rocha Junior et al., 2013), that promotes the stabilization of the larger aggregates and consequently giving physical protection to the organic material. On the other hand, the higher OC content in the smaller aggregates (0.50-0.25 mm) may be related to the greater microbial activity in the soils of the forestry fragment, which favored the transformation of the material that is not physically protected, increasing the OC content of the recalcitrant fraction that has greater interaction with the fractions of smaller aggregates (Six et al., 2002). Due to the high index of macroaggregates (aggregates high than 2 mm) found in all areas, it is suggested that organic material may be favoring the aggregation, and consequently leading to greater availability of P (Wright, 2009; Andrade et al., 2003). How higher content of organic matter in the soil increases the competition of the organic acids by the same adsorption site of the P adsorption (Andrade et al., 2003). In addition, the greater aggregation of the soil reduces the exposed area decreasing the adsorption sites. Since the larger diameter aggregates classes (> 1 mm), generally showed higher sand content compared to the smaller one, which had higher clay content (with silicates and oxides composition), and this causes the smaller aggregates to offer more sites of P adsorption, and consequently greater interaction of this element with the solid phase of the soil. This explains the higher values of extractable inorganic P in different land uses (forestry, pasture and agroforestry) in the larger aggregate classes, which resulted in less interaction of this element with the solid phase components of the soil. In the comparison between the smaller aggregates (1.00-0.50, 0.50-0.25 mm) the greater availability of inorganic P in the aggregate class 1.00-0.50 mm is related to the higher sand content in this class. This result stands out the importance of cropping systems that prioritize the no soil disturbance, due to soil preparation causing soil breaking and spraying of aggregates and consequently reduce the inorganic P availability for the crops. Oliveira et al. (2010) studying cerrado soil`s corroborate with this information, verified similar results to the present study, finding greater availability of inorganic P in the classes of larger aggregates. In general, the higher inorganic P availability in the different land uses (forestry, pasture and agroforestry) verified in the PNa1 fraction, may be related to the extraction of secondary forms of inorganic P associated to Fe and Al. As the soils of the present study are Ferralsol (very weathered), it is common in this region to find gibbsite and goethite as well as low crystallinity kaolinite in the clay fraction (Pacheco, 2011), which present a great capacity for P adsorption. Among the land uses, the one that presented highest P moderately available (PNa1) was the agroforestry system (Figure 4). Tokura et al. (2002) studying Ferralsol and Arenosols soils in the cerrado region showed a similar result. 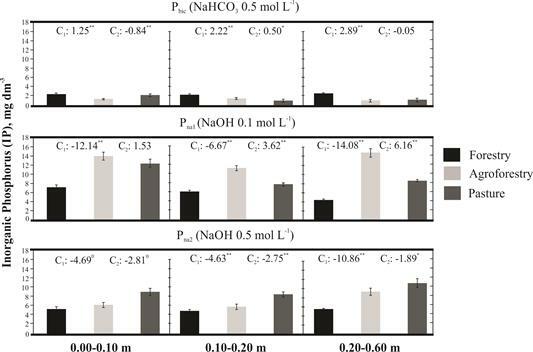 However, according to these authors, the tendency for higher available values of P with NaOH 0.1 mol L-1 is disadvantageous, since this fraction is shown to be relatively less available than the more labile fractions. On the other hand, Araújo et al. (2004) with a study developed in the semi-arid soils, found in this fraction (NaOH 0.1 mol L-1) a preponderant role in the maintenance process of inorganic P (available), demonstrating its importance in the Ferralsol and Luvisols. When P readily available (Pbic) was evaluated, the low values verified in the present study was expected, in agreement with the results of other studies (Wright, 2009; Xavier et al., 2011). As in the present study the soils are very weathered, increasing their capacity to adsorb anions, reducing the availability of P in the soil solution (Andrade et al., 2003). Comparing the land use areas, high values of P readily available (Pbic) at all depths (0.00-0.10, 0.10-0.20, 0.20-0.60 m) found in the forestry fragment follow by agroforestry system, can be related to the greater nutrient cycling provided by this land use. Forestry areas promotes diversity of material contributed to the soil, as leaves of different species, branches and fruits, and also a continuous supply of organic residues, as a consequence of the action of diversified root systems, which promotes greater efficiency in the nutrient cycling (Iwata et al., 2012). Our results are consistent with those obtained by Nogueira and Oliveira (2008), who verified the influence of the continuous organic matter input in areas under agroforestry systems and forestry fragment, attributed to the high diversity of the organic material contributed to the soil as responsible for the increase of P available compared to conventional soil cultivation systems. Higher deposition of organic material in the soil led to increase the soluble C content (Rocha Junior et al., 2014). These organic acids compete for the same adsorption site of inorganic P, increasing the availability of P in the soil solution (Andrade et al., 2003). The higher values of P restricted availability (PNa2) in the pasture, is possibly related to the higher absorption of the other forms of P (readily available - Pbic and moderately available - PNa1) which are more labile forms, by this monoculture. As the pasture root system has a higher volume in the initial layer, it could present a great capacity to absorb more labile P forms, remaining in the soil just P with lower availability and low equilibrium with P in soil solution. In addition, due to the high aggregation of the soil under pasture it may have led to the protection of the inorganic P within the aggregates, and it is not possible to extract them by the Pbic and PNa1 extractors. The conversion of the forestry fragment for the establishment of pasture and agroforestry systems promoted a positive effect on the physical structure of the soil. The highest OC contents occurred in the forestry fragment in aggregates larger than 1 mm. Regardless of the land use, the increased of availability of P readily available (Pbic), P moderately available (PNa1) and P with restricted availability (PNa2) was found in aggregates > 1mm, especially those between 4-2 mm. The soil under forestry fragment presented the highest levels of P readily available (Pbic), while the soil under agroforestry system showed the highest levels of P moderately available (PNa1), and the soil under pasture had the highest values of P with restricted availability (PNa2). Preserving the soil structure from its proper management becomes fundamental in view of the increase of the P availability and OC contents, in all land use, with aggregates higher than 1 mm, this directly affects the plant production and soil quality.